it is pricey and isn’t prettiest one, but man, he knows what to teach. that understanding, much less willing teach it to other. This course is one of the kinds and it stands out of the crowd boldly. It is inclusive introduction to UNIX and Linux, and to say it is superb work as from methodological point of view. The complexity of lessons increase gradually and it is amazing to see as you learn subjects that other had spend years to break through. One friend of mine, who is our “local huru” and “supervised” my venture into UNIX was really stunned by progress I made in some 6 days. As one reviewer put, Mr. Vinnik knows the educational needs of his customers and addresses them in most intelligent and time saving manner. I liked very much that the training doesn’t stop on commands but goes far into subjects, including history of issue and analyses the reason we do this or that. For example when it comes to files compression or packing this DVD not just provides the commands to use, but he shares the experience of what is more useful, which commands are better be used for each particular situation. You will be given the background of each subject in adoptable way, so you can get into problem with clear understanding why this has to be done this way or that way. I can tell that every lesson is very focused on a subject. You are given precisely what do you need to have the job done plus insight of what you can do further. I say, this course takes practical approach but I can feel, and it is good feeling that the course has underlying academic structure. I doubt one can pick more knowledge from full-length college course on UNIX than this training provides. As you step into UNIX or Linux, you inevitably start communicating with other people, on forums or in person and then you will really appreciate all the weight of information you were given. It is funny to discover at some point, like one week after you started, as you start teaching other, friends or colleagues and they listen and you feel like been doing it for years. I started learning Linux, as I’m self-employed and sell some products that last year reached Linux and Solaris market. Granted, I was in need mastering UNIX for getting better idea of what I sell ;). But very soon I found myself installing stuff for customers, making some minor changes in configuration files (thanks to vi lesson) and so on. So in my case this course fulfilled its purpose. It was really nice learning but let me tell you, that this DVD course implies that you will LEARN. It is absolutely necessary to sit down in front of computer as you watch and type commands, read man pages, follow advices and trying, trying, trying. It is not for someone lazy who expects watching DVD and become guru. If you have in mind actual learning this course is indispensable, but it is true to almost any learning. Linux isn’t simple so it takes effort to learn. The ad for this title emphasizes that this DVD course teaches the “workflow”. I really couldn’t appreciate it before I hit some real life issues. The “workflow” this DVD provides, it keeps you going; it helps not to be overwhelmed by situation and complexity. Every lesson in some way has something to do with next lesson even if the subjects are independent. As you move from one subject to another, especially as you reach the middle of the course, you start having a feeling that you actually doing cool stuff! And you not just typing but understand what is going on. I have no doubts that this DVD course is successful because of that feeling and having the certificates even improves that feeling..
As some of previous reviewers, I had tried many books and various online “free” and paid materials on Linux and UNIX before I decided to commit. But in the same way as other person mentioned, I couldn’t force myself to go trough more than five-ten pages of any of those books. It is dead boring read, then type, then read, then type, not to mention that commands in books in many cases come with options that will not work in your linux and it confuses terribly as you learn. The online training I have tried, no matters for free of for fee is pure cheat as their simply take the man pages and some guy reads the page with virtually zero explanations provided. Another way to cheat is by “teaching” Linux by describing KDE buttons; it really has nothing to do with actual Linux training. This DVD course actually provides much more than a course itself. It comes with knowledgeable instructor who actually (it is hard to believe but it is true) is available via email. Mr. Vinnik answers relevant questions if you have some. To his credit, he always answered my emails with utmost care and attention. I must say, that perception plays a great deal in a process of learning. The course sets the mood, the pro style approach to problems by broad margin wins as a corporative training as well. 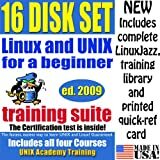 As I go from customer to customer I can observe more and more people who made their steps into Linux or UNIX with these DVD courses. There’s no doubt that employing both video and audio components, which are essential for DVD facilitates the learning. It is also the perfect training for people like myself who watches five minutes for any training and then for another hour HBO movie ;). I remember my first frightened look at a UNIX terminal. It was a little green ‘%’ with blinking cursor. I stared at the little prompt not knowing what to do, then I pressed some keys and things became much worse. Now I’m surfing enormous hierarchies of file structures, able to get to the root and back again, create and edit configuration files and so on. Thanks for relevant training! This is very nice college style course (actually much clearer and complete). This course teaches the systematic approach and it is why it is so valuable. It teaches commands and it explains why and how. Do not expect an easy passage. The course is about complex subjects and requires great deal of exercises and additional included reading. The included library offers many valuable books and saves good deal of $$. It is also nicely systematized. It includes books for beginners, more advanced subjects and books for starting system administrator as well. I like their approach to certifications. The test questions are inside the envelope and you can complete them on your own pace. The test is fairly simple and helps capitalize on your knowledge. Do not expect this course to be Hollywood style movie that you watch for 4 hours and get up a guru. I must admit I learned a lot from it. Watch Video Here: http://www.amazon.com/review/R2K9GTE7CANCEJ This DVD course is what it claims to be: the solid, comprehensive training for a beginner and introduction to Linux, UNIX and network technologies. The included library on CD features books on every subject beginner may think of and Linux installation is included! This video is the introduction to the network part of the course from their website (the first part is also included with this 4DVDs+2CDs set). The UNIX training he is mentioning is included in this set. I highly recommend this course, it beats reading all the Unix books that are out there. Not only do you have an instructor that knows what he’s talking, but it is explained in such a simple way,that you learn by doing.To my opinion it is the best UNIX training available.